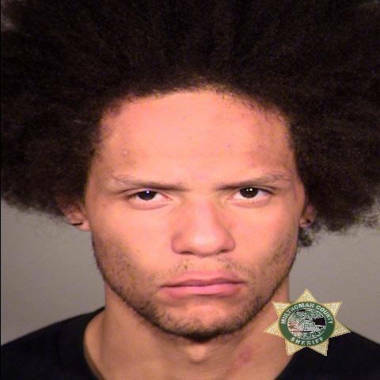 A Portland pimp is suing Nike for not placing a warning label in their shoes specifying that they could be used as a dangerous weapon -- after he was sentenced to 100 years in prison for brutally beating a john with his sneaker. Sirgiorgio Clardy in June 2012. Sirgiorgio Clardy, 26, claims Nike should have placed a warning in the shoes warning consumers that the kicks have the potential to be used as a dangerous weapon, according to The Oregonian newspaper. Clardy is seeking $100 million for what he believes was the shoe manufacturer’s oversight. In June, Clardy repeatedly stomped on the face of a client with his Jordan Nike shoes when the man refused to pay Clardy’s prostitute. The man required stitches and plastic surgery after the beating. Clardy was sentenced to 100 years in prison for beating the man as well as attacking an 18-year-old prostitute so violently that she bled from her ears. Clardy has been charged with numerous felonies and misdemeanors, according to the Multnomah County Sheriff's Office. The jury in Clardy’s most recent case called him a “dangerous offender” and classified his shoes as “a dangerous weapon” in order to assure he received the longest prison sentence possible, according to The Oregonian. The suit has not yet been served to Nike, The Oregonian said. Nike spokeswoman Mary Remuzzi said the company had no comment regarding the lawsuit.